Delta’s new A350’s offer an industry leading premium economy, on par with what’d you find on five star airlines like Singapore, JAL and more. We’re talking a much bigger seat, lots of legroom, big screens, very solid booze and if you’re into miles, you get a lot more of those too. These deals are available starting at $747 all in,for round trip travel to Shanghai or Beijing, from: Los Angeles, Orlando, Austin – and likely quite a few more cities, but we’re excited so we’re pushing this one out fast! The easiest availability to find is in October, November and December of 2018, though for some cities you can go well into 2019 as well. Considering most people pay at least $800 for a standard economy experience, you’re seriously winning here, and by booking direct, you’re able to ensure the best customer service experience possible. Deals like this are exciting, and often don’t last long. If you want to book one of these deals, we highly recommend booking today. All Delta tickets from the USA for travel more than 7 days from now offer free 24 hour cancellation, where you’ll get a full refund, so it’s better to lock these deals in than miss out. Be sure to route via Detroit or Los Angeles to ensure the best new seat, and use Google Flights to confirm the long haul is operated by an Airbus A350. Here are the best round trip Delta Premium Select deals available, like: $747 Los Angeles to Shanghai, $850 Orlando to Beijing, $875 Austin to Beijing. Feel free to post more options in the comments! Are you jetting off to China? 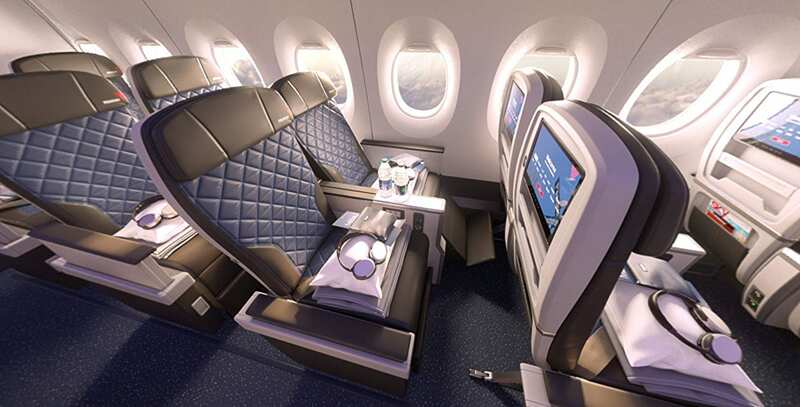 Maybe I shouldn’t comment as I have not tried Delta’s only competitors premium economy. But from my experiences I disagree that the premium economy is “a seat you stand a fighting chance to get a good (or at least decent) nights sleep in” For my I would much prefer to pay the $500 each way and get a flat bed business class seat that I can sleep in. I find premium economy seats are no easier to sleep in then a regular economy seat…. but that is just me. $1000K roundtrip in Business Classon what airline. Never have seen such an animal! Sorry but it’s a massive stretch to call Delta’s A350 Premium economy “industry leading”. In fact, together with CX and SQ they have gone for an 8-abreast layout with the narrowest Premium Economy seats in the industry, only 18.5” width, comparable to 9-abreast economy on a 777. This is a frustrating trend on the A350 in particular that is massively devaluing the premium economy product. Most airlines including BA and Virgin use only 7-abreast seating in Premium economy with 20” width on their 787 fleets and the A350 cabin is only 6” wider than a 787 cabin. The fare is very good but the product is sub-par with most premium economy experiences.